Anxiety, fears and phobias limit your life. You wake up with a new idea, a new goal, an ambition that you know would change your life for the better, but then, something changes, you start to feel nervous, you worry about failing, uncertainty takes control of your mind. This gut feeling stops you from taking action. 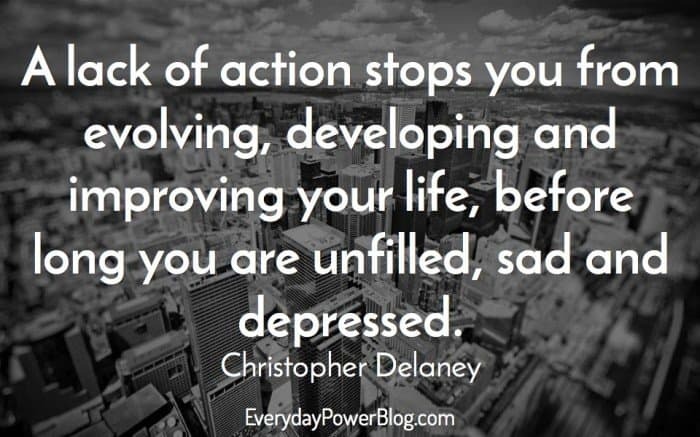 A lack of action stops you from evolving, developing and improving your life, before long you are unfilled, sad and depressed. 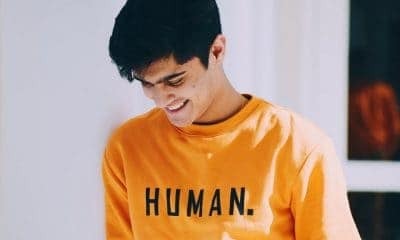 You can beat anxiety, you can take back the control and you can live your life to the full by following these 3 simple law. People living with anxiety, fears and phobias focus on the negative of situations, presuming that things will always go wrong. If you focus on the negative you will feel negative. This negative focus only increases your anxiety. Imagine you are asked to speak publicly; your anxiety focuses your mind on past negative public speaking experiences, you feel the associated negative emotions, you imagine people laughing at you, doubling your feeling of anxiety. To change your emotional feeling you need to change what you focus on. You can only feel one emotion at a time. What you see in the real world or what you imagine, dream or think about creates associated (positive or negative) emotions. Think about the situation that makes you anxious. Now, think about the same situation but this time imagine yourself in this situation, as a confident, calm and relaxed version of yourself. 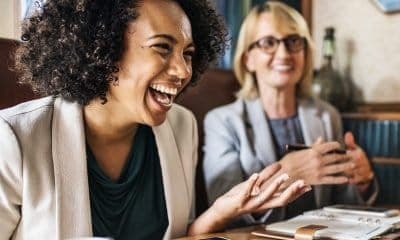 See you acting confident, communicating in a calm way, imagine yourself enjoying the experience and notice how others respond to this confident and relaxed version of yourself. If you imagine yourself acting confident and relaxed in a situation you will feel this associated emotion in the real world. The more your practice this, the stronger the associated emotion will become, and soon this emotion will be associated to the real world experience. Your mind and body are connected. Your stance, posture, the way you hold yourself, your body language and posture change your current emotion. Think back to two past experiences. The first, an experience when you will sad, anxious or depressed. For the second experience, remember a time when you were confident, excited and happy. Next compare these two memories and notice the difference in your stance and posture. Compare your body language and stance. When feeling negative people will often see themselves with their head down, slump shoulders, often hugging themselves or fidgeting. 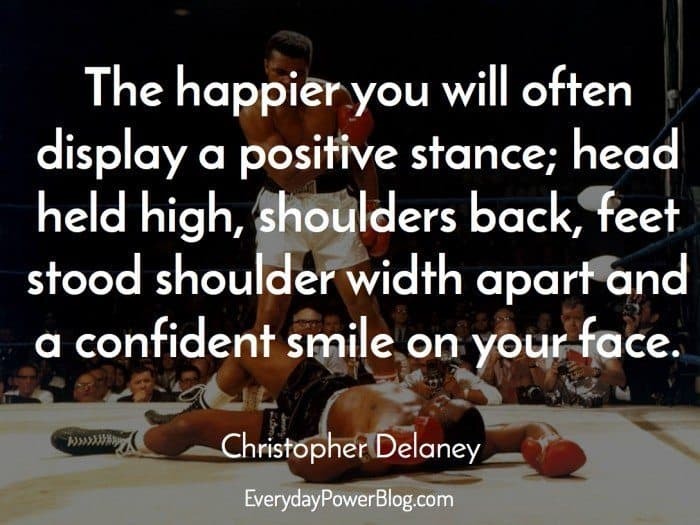 The happier you will often display a positive stance; head held high, shoulders back, feet stood shoulder width apart and a confident smile on your face. To feel more confident and less anxious change your stance. 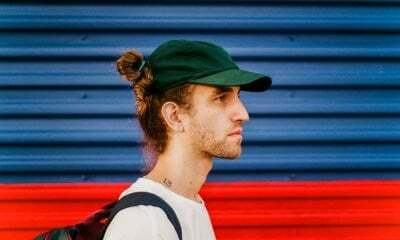 When anxious you will often find that your own negative self-talk, that little devil in your head increase your anxiety by whispering negative affirmations. “You can’t do that” “you have always been a failure” “others are better then you”. To feel confident you need to kill the devil in your head. 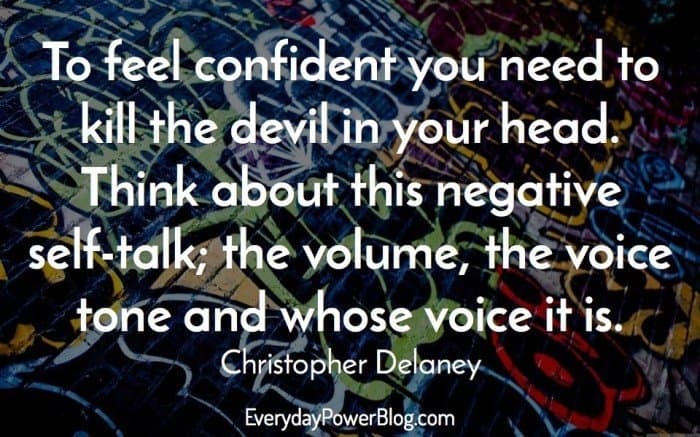 Think about this negative self-talk; the volume, the voice tone and whose voice it is.